The Sundarbans, bordering Bangladesh and India, is one of the wildest, most dangerous places on the planet. Hostile to humans it is a land where the Tiger is still king of the jungle. However, the Tigers within the world’s largest mangrove forest have turned their backs on their natural prey and started hunting people instead. An official of the Bangladesh Forest Department said that at least 232 people were killed in a tiger-human conflict between 2001 and 2014. It is, therefore, no wonder Tiger numbers in the Sundarbans have dropped dramatically over the last 14 years. There were thought to be 440 Tigers in 2004 compared to only 106 in 2015. The Bangladesh Forest department attributed the massive drop in just a decade to illegal poaching and increasing human-tiger conflict. The tiger has been listed as endangered by the IUCN Red List of Threatened Species since 2010. 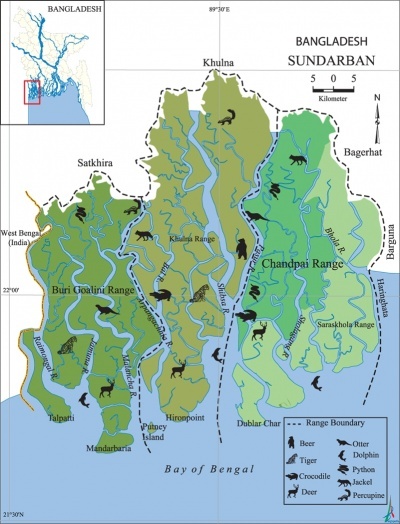 The Forest Department in Bangladesh is currently conducting a new census in collaboration with WildTeam, a Non-Governmental Organisation (NGO), working for Tiger conservation in the country under the Bengal Tiger Conservation Activity funded by the USAID (United States Agency for International Development). Md Sayed Ali, a divisional forest officer revealed the previous census that 2015 recorded a Tiger population of just 106 - a dramatic 76% lower than previously thought. The Sundarbans is a tidal jungle that has been created where the Ganges and Brahmaputra rivers enter the Bay of Bengal and are the last stronghold for the Royal Bengal Tiger. In bad years the Tigers of the Sundarbans are responsible for up to 50 human deaths a year. No one knows exactly why these tigers tend to be more aggressive than those in other parts of the world and why they have developed a taste for human flesh. Old, sick or injured Tigers may find it easier to kill humans, and perhaps some Tigers have added people to their diet after feeding on human corpses following cyclones that are common in the area. The problem ultimately seems to stem from an ever-shrinking habitat range and a shortage of prey. Over one million people live on the fringes of the Sundarbans and food shortage is a problem for humans and tigers alike, each poaching the others prey, and for the Tiger, a man’s body can provide a tiger with food for several days. If cattle are allowed to graze in the forest the Tiger will eventually start eating them and following the cattle into the villages. As villages on the edge of the Sundarbans expand, forest resources are being used up. As a direct result locals are illegally poaching deer, the Tigers natural wild food source. Therefore, the Tiger is going hungry and has a result picking off humans. The Sundarbans is a Unesco World Heritage site and many people enter protected areas to fish Illegally, cut firewood and poach animals, bringing them in to direct conflict with the tiger. In 2014 there were two tiger attacks while locals fished for crabs. One of the most dangerous jobs in Bangladesh is being a wild honey collector. April 1st each year marks the start of the official honey collecting season. Hundreds of boats gather in the Sundarbans and race towards the forest to find the best honey spots. However, not all the honey collectors will return alive. Up to 20 people are killed by Tigers during this time. Tiger scientists are desperate to end the bloodshed in the battle to save an endangered a big cat while keeping local people safe. The Tigers are making things very difficult, as it is no longer just the people working inside the jungle that are at risk of being attacked. One thing is certain, for the Tigers of the Sundarbans, eating people has become a habit. There are so few Tigers left in the wild that each one is precious. They are protected by law in Bangladesh, but it’s hard to persuade people of the Tigers value when they are causing so much tragedy. Villages are encouraged to use and train street dogs as a canine defense force to warn people of an approaching Tiger and hopefully scare it away for good. 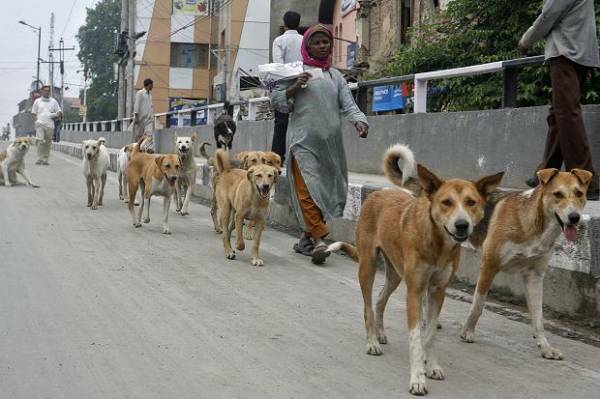 The dogs of Bangladesh are seen as pests and by nature are generally scared of anything and everything. International dog-trainers experts have been brought in to help produce formidable guard dogs from mangy mutts found scavenging village garbage cans. This relatively successful initiative has literally seen these underdogs transform from a nuisance to proud protectors of their communities from Tiger attacks. Similar initiatives using dogs to guard livestock and communities against big cats have been successfully implemented in other countries, such as the Anatolian Guard Dog Program helping farmers in South Africa in non-lethal conflict mitigation with the Cheetah. Educating the locals about the Tiger is if so key in resolving the crisis and stop locals taking the law into their own hands. The human-tiger problem must be solved, as the repercussions are huge for people and Tigers. The Tiger is the keeper of the forest. If the Tiger goes then the forest will follow. If people can find a way to minimize conflict then the Tiger may be seen as the regions greatest asset and the Sundarbans will hopefully remain the last great refuge for the Tiger. A new Tiger census began in November 2016 using camera trapping methodology to determine the overall tiger population in the world’s largest mangrove forest, of which around 60% lies within Bangladesh. “We set up 804 cameras at 402 stations in the range to collect data of tiger movement and density in the area,” said Md Sayed Ali, divisional forest officer at the Sundarbans West Zone. “Each camera takes a photo every 5-10 seconds.” Using photos taken by the cameras, the population in Satkhira range will be determined by analysing the stripes on the tigers – each tiger has its own unique set of stripes, similar to fingerprints for humans. “We will have the accurate number of tigers in Satkhira by September,” Sayed added.